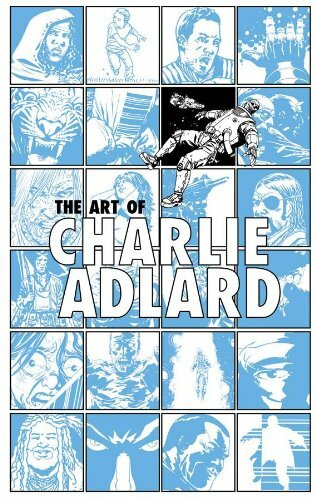 This is a nice artbook for the comic artist Charlie Adlard, whose most prominent work is probably from The Walking Dead comic series. The book covers his career so it goes years before he drew for The Walking Dead in 2004. There are stories his childhood, teenage years, the days where he looked for work at comic conventions, the different drawing jobs he took over the years, and of course how the got into The Walking Dead and the other titles beyond walking dead. The art is great. Even on the cover art you can see what Charlie Adlard is so good at, the characters he draws and his amazing use of black and white. He's most comfortable in black and white so you get to see the bulk of his work in this style. Additionally, there are also examples of his colour painted works, as well as a rather interesting comic rendered in charcoal called White Death. Besides zombie art, you'll see the comic pages for The X-Files, Batman: Gothman Knights, Judge Dredd, Codeflesh and others. Majority of work is for The Walking Dead that he has been working on for close to a decade. The text provides a clear overview of his career progression. There are also guest writeup by Jonathan Ross, White Death writer Robbie Morrison, special effects guy Greg Nicotero and of course Robert Kirkman. The unprecedented look at the making of the 100th issue is actually a look at the penciled laid out panels side by side with the finished inks. It's quite interesting to see finalised ink heavy version. Unfortunately, there's no commentary for this section. It's a cool artbook for fans of Charlie Adlard and comic art. If you want to check out more of his art, you can look for The Walking Dead: The Covers artbook.